The temple is among the 108 divyadesams of Sri Vaishnavas and comes under Tondai naatu divyadesams in Kanchipuram. It is one of the three most popular temples in Kanchipuram - the others being Sri Ekambareeswarar temple and Lord Varadaraja perumal temple. It is one of two temples in Kanchipuram where a divyadesam is inside a Shaivite temple. The main sanctum is of Sri Kamakshi amman and the presiding deity for the divyadesam is Sri Aadhi Varaha perumal. Thayar is known as Anjilaivalli thayar. As Mother Kamakshi is supreme and dominant in this region, the nivedhnas and puja codes followed for Her, is followed in all temples. Abishek to Kalva Perumal is performed only with an oil called Sambiranai Thailam. According to a story, Emperor Dasaratha worshipped Mother Kamakshi and Kalva Perumal before performing the yajna seeking Son Boon. It is also said that Lord Kalva Perumal advised Dasaratha to so. Sage Durvasa, though a Lord Shiva devotee had worshipped Lord Kalva Perumal. There is a mandap before the sanctum as the Gayatri Mandap in Mother Kamakshi shrine and also one under this mandap with Mother Kamakshi, it is said. It is explained that though the temple belongs to Kamakshi, She rules with due respect to Her elder Brother Kalva Perumal. Those entering this mandap have to sit and worship. Brothers and sisters are advised to worship Mother Kamakashi the sister and Lord Kalva Perumal the brother simultaneously for cordial relationship. Lord Vishnu and Mother Mahalakshmi were discussing about the sins and good deeds of humans and their illusions about material achievements. During the course of the talk, the subject turned on beauty, personality etc. Mother Mahalakshmi said that people become prosperous at Her very sight because She was fair in complexion and went on to irritate Lord because He was dark in colour. Lord smilingly replied that real beauty was in the mind and not in external looks which only took people to illusions. Mother did not subscribe to this theory. Lord said, “You can love beauty but it should not make you proud. You have placed more importance and love on your beauty. You will become formless and your beauty will not be visible.” Mother did not expect this curse and sought His pardon and way to relief. Lord Vishnu advised Her to perform penance at a place that would bring a crorefold benefit for a single prayer. Mother Mahalakshmi reached Kancheepuram where Mother Parvathi too performed penance on Lord Ekambareswara. Mahalaskhmi got Her original form back. Due to her intense penance, She became superlatively beautiful that drew Lord Vishnu Himself. 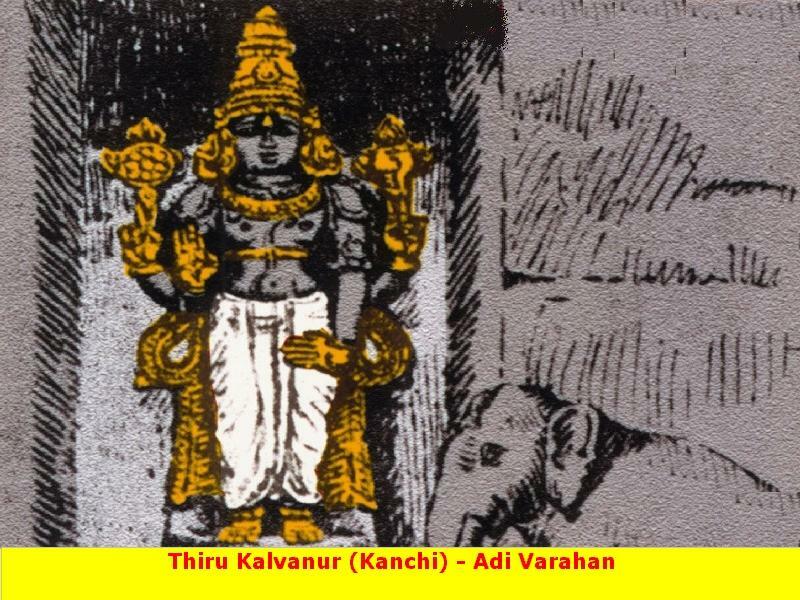 He saw Her hiding without Her knowledge and hence called Kalva (hiding like a thief) Perumal. Lord Kalva Perumal graces on a wall right of the Gayatri Mandap facing southeast direction. On the left wall graces Mother Mahalakshmi only with two hands against the traditional four in a worshipping form which is attributed to Her shedding Her pride. Mother Mahalakshmi also graces without a form (Aroopa-formless) in another wall behind Kamakshi Sanctum. It appears as if the form is split. People worship with kumkum on this form so that they would conquer pride caused by a beautiful complexion. Devotees have to worship Lord Kalava Perumal and Mother Mahalakshmi only after worshipping Aroopa Lakshmi Thayar. It is the faith of the devotees that worshipping Lord Vishnu and Mother Mahalakshmi together would bring them prosperity and growth in professions. Festivals: Vaikunta Ekadasi in December-January and Navarathri in September-October are the festivals celebrated in the temple. The temple is open from 06:00 a.m. to 12:30 p.m. and from 04:00 p.m. to 08:30 p.m. 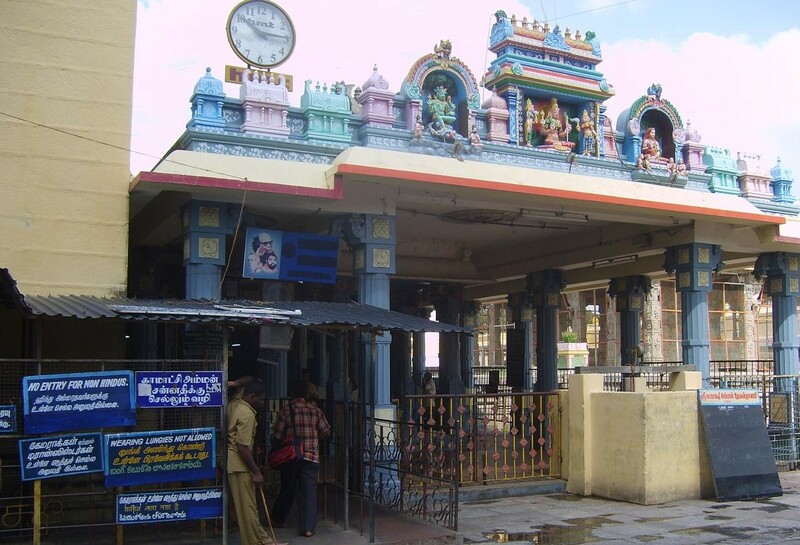 The temple is at a walkable distance from Kanchipuram bus stand.